It's Peanut day again for Ben! We love our Peanuts around here, and I do have a good variety of elephant picks & cutters because of that. Ben had chicken salad roll ups on tortillas, topped with a cheese Peanut (opposite cheese ear and a a sugar eye). He had some carrot sticks, a couple of Peanut shaped animal crackers, strawberries, cantaloupe, grapes (with Peanut picks) and a Peanut skewer of blueberries. How cute are all those elephants? I love it! 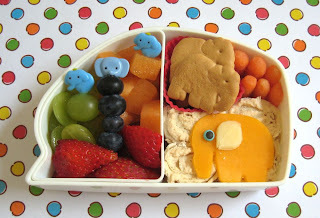 Elephant theme bento??? :) Super cute and yummy bento..love these. Oooh!! I absolutely love your elephants!! Kimi loves elephants too! I got to make this!! :) Tks for the idea. Btw, did u handcut the cheese elephant or u used a cutter? Tks!